But by the late nineties, when people like Tony Hawk and Bob Burnquist turned skateboarding into a national obsession, the man outside the car started riding a skateboard. He'd grind down railings and across telephone wires, ollie over smokestacks, and stall on movie theater signs. 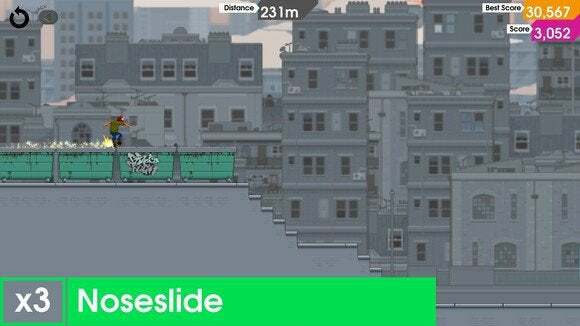 OlliOlli is that man from my childhood in video game form. There hasn't been a good skateboarding game in longer than I care to think about. Tony Hawk died with THUG 2. Skate died with... Skate 2 maybe? I guess Skate 3 if you're feeling generous. OlliOlli is a fantastic skateboarding game, and it even lifts some ideas from its predecessors. From Skate you get the analog stick-based trick system. From early Tony Hawk you get the objective-based levels. 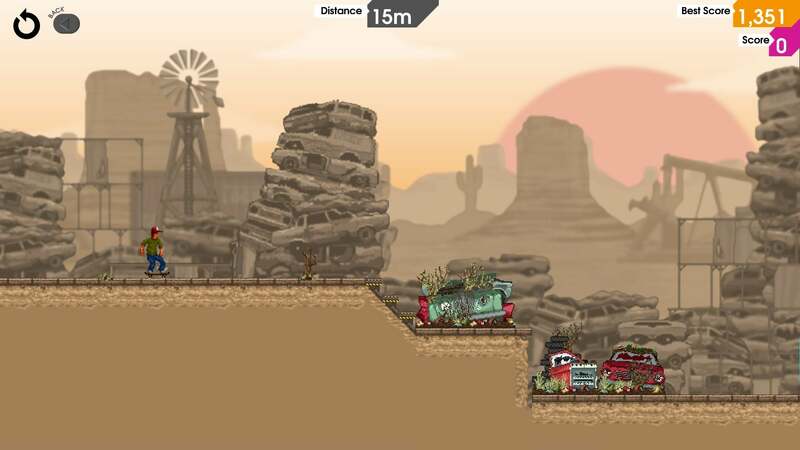 But OlliOlli's really nothing like its free-form predecessors. 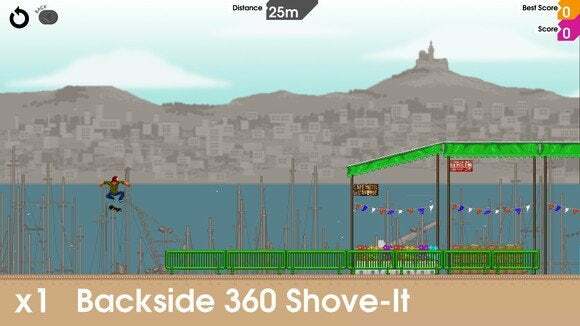 Like the imaginary man from my childhood, OlliOlli's skater is confined to a two-dimensional cross-section filled with jumps and rails and hazards. Your goal is to fulfill as many objectives as possible and make it to the bottom of each run without dying. It's harder than it sounds. One missed jump or one screwy grind and you're liable to catch your board on the edge of an obstacle and face-plant straight into the cold concrete. You also have to perfectly time a button tap before hitting the ground, or else you'll lose valuable speed and (if you screw up hard enough) your balance. It's a puzzle game. That's what you start to realize the longer you play OlliOlli. It sets itself up as an action game, but that's just a layer of abstraction. This is an elaborate puzzle game where your skateboard is the solution—grind this rail to pick up speed, then hardflip out to jump over the trash can, land on the telephone wire and grind it to the end, ollie out onto the bench, hit the ground with a perfectly-timed button press so you're ready to kickflip off again, and so on and so forth. And forget just making it to the bottom. With only one life per run, OlliOlli makes you optimize your jumps and tricks to a painstaking degree in order to reach the highest scores. Like Skate, it's not your character getting better—it's you. It's you coming to understand the (intimidating) amount of depth in the controls. It's the type of game where you slip into a Zen routine, chaining together tricks on reflex to a mantra of "One more run, one more run," until you check the time and realize an hour or two went by. It's one of the most addictive, short-burst games I've ever played. I have my criticisms though. There are fifty levels in the game, and you're likely to get your fill before those fifty levels are up. After a while, addictive or no, there's just a point where you feel like you've already experienced every level variance the game has to offer. It doesn't help that all fifty levels fall into just five environments, and levels within an environment feel very similar. By the seventh or eighth in each group I wanted to move on. The game also has trouble keeping up with its own speed. At times you can get your character moving so quickly that everything turns into a semi-blurry mess, which makes it hard to nail those tricks the way you need. At a certain point you start playing levels by muscle memory—getting killed, and then reflexively avoiding that trap the second time around. And this is my own nitpick (and thus has no effect on the score for me), but I miss the pop-punk aesthetic of Tony Hawk. These aren't Tony Hawk games, of course, but I tie that music genre in with skateboarding so much that OlliOlli's electronica soundtrack—while certainly gorgeous—isn't what I want to hear. 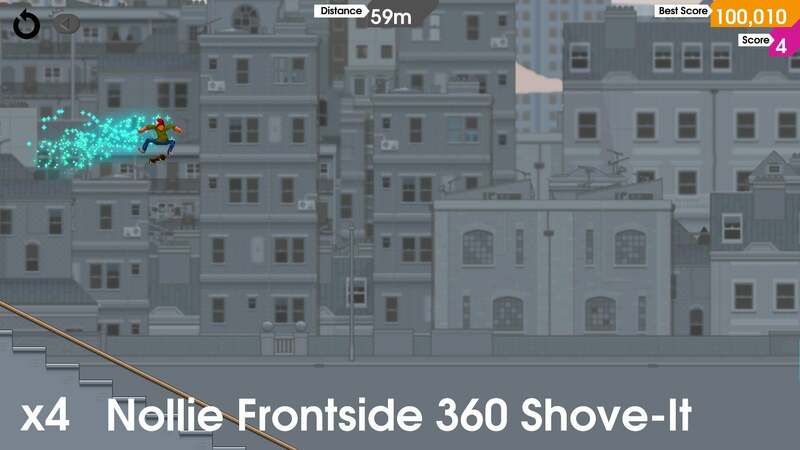 OlliOlli's no replacement for the Tony Hawk games of yore, but it's not trying to be. It's a fast-paced puzzler with an appealing modern aesthetic and a fantastic (albeit borrowed) control scheme. The fact that it also reminds me of a weird shared-experience from my childhood? Well, that's just the Mountain Dew-flavored icing.